Courtesy Thomas Barry Fine Arts, Minneapolis, MN. Used with permission. A little over a decade ago, ASA past-president Herbert Gans embarked upon an intriguing and, to our knowledge, unprecedented study of bestselling books written by professional sociologists. On the heels of his presidential campaign to make sociology more visible and influential to the lay public, Gans believed such a study would help us better understand the general reading public’s interest in and understanding of sociology’s knowledge, information, and insights. The main results of Gans’s study, published as a featured essay in our sister publication Contemporary Sociology, weren’t particularly encouraging. He found that only one book (David Riesman, Nathan Glazer, and Reuel Denney’s classic The Lonely Crowd) had sold over the benchmark of a million copies and only two (Tally’s Corner by Elliot Liebow and The Pursuit of Loneliness by Philip Slater) had sold over 500,000. In the 50-year period Gans examined, only 53 sociology books had sold over 50,000 copies. Gans concluded that sociology had “a long way to go before it makes a significant impression on the general public” and, if that was the goal, trying to write bestsellers was probably not the way to make that impression. But Gans’s study had a silver lining: it provided clues as to where and how sociology was best suited to contribute to the public. Books about inequality (like William Ryan’s Blaming the Victim) and about family, children, and relationships (like Lillian Rubin’s Worlds of Pain) topped the list. There were also several big, synthetic analyses of American society—for example, Robert Bellah et al.’s Habits of the Heart or Richard Sennett’s The Fall of Public Man—whose social impact was easily matched by their sales numbers. Going further, Gans pointed out several stylistic characteristics shared by the books. Top sellers did not use jargon, tended to have a strong narrative or storyline (rather than simply reporting research results), and took an interdisciplinary approach. Recent changes in the publishing industry and the popularity of books like Steven Levitt and Stephen Dubner’s Freakonomics and Malcolm Gladwell’s Outliers inspired us—the Contexts graduate student editorial board—to update Gans’s seminal study. Tackling this challenge, we gathered data from the publishing industry’s largest provider of retail sales information to take a new look at recent bestsellers written by sociologists and bought by the public. Although we couldn’t directly replicate Gans’s study (for reasons discussed below), our results echo some of his earlier findings and conclusions. However, they also reveal some shifts in the landscape. Books about crime, media, and race do remarkably well, but we found very few broad, societal-level interpretations of American life. Using our new data, we speculate on some findings and expand on Gans’s concluding reflections about how best to collaborate with others to bring sociology to broader audiences. Setting out to replicate Gans’s study, or even to gather comparable data, was no small task. First, our method for gathering sales data diverged from Gans’s. In his study, Gans gathered sales figures through a questionnaire mailed to authors and presses. From this self-reported data, he grouped books based on numerical intervals of total books sold (for example, The Lonely Crowd sold over 1 million copies, whereas Howard Becker’s Outsiders and Kai Erikson’s Wayward Puritans sold between 100,000 and 150,000). Further, we chose to focus specifically on retail sales and exclude institutional sales and course adoptions (as well as introductory textbooks). Using retail sales alone captures the public’s interest in sociology, while course adoptions and bulk academic sales to institutions are more likely to reflect only what sells well in academic circles. Because Gans was unable to distinguish between retail and institutional sales in his study, our data comes closer to his original intent. That said, our list likely overlooks books primarily assigned in courses or purchased by libraries (though this has declined dramatically since Gans’s study). The result is that our two lists cannot be directly compared. To get our numbers, then, we had to find other sources for more accurate sales information. We combed through ten years of New York Times Non-Fiction Bestsellers lists, but did not find much. Books by sociologists simply do not make the list (and the list itself is, as one reviewer pointed out, determined by editors and not sales). Then we tracked Amazon sales rankings for fifty or so popular sociology titles, but learned that Amazon captures, at best, fourteen percent of the consumer market and industry insiders suspect the rankings themselves are skewed for marketing purposes. Finally then, because we were primarily interested in retail sales, we contacted BookScan. The largest national provider of retail book sales data, BookScan was launched in 2001 by Nielsen, the television tracking company that has been measuring ratings for more than fifty years. To track books instead of broadcasts, BookScan collects and tallies sales data from major book retailers like Barnes & Noble, Borders, and Amazon. 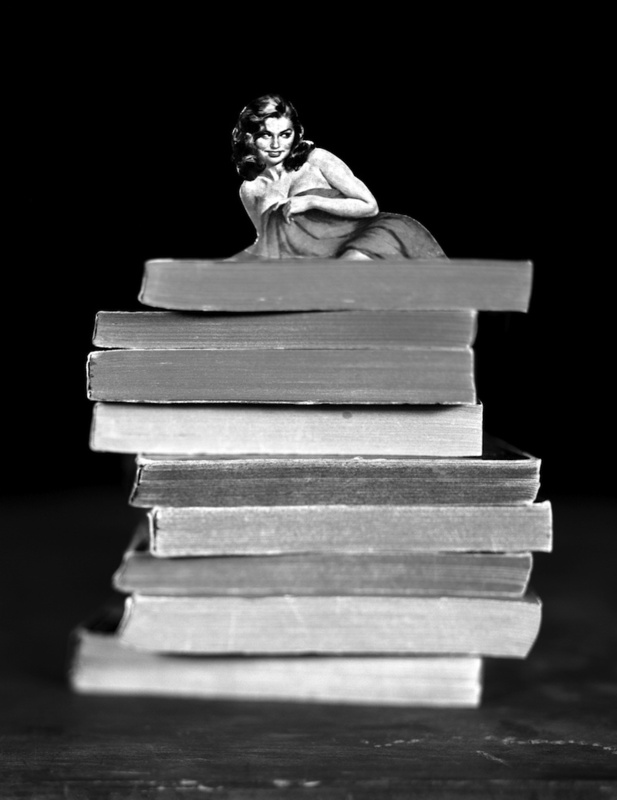 The company claims to capture 75 percent of the retail book market in the United States, and, according to an article by Daniel Gross on Slate, it’s become the primary source of reliable sales information for authors, editors, and agents in an otherwise mysterious, shrouded market. For our study, BookScan generously provided annual sales data for the top 10,000 social science books sold in each year from 2004 to 2008. We selected the top ten to fifteen books sold each year that were written by authors with either an advanced degree in sociology or experience teaching in sociology departments. We then supplemented the list by including all sociologists who had cumulative sales in the top 1,000 social science books in the five-year period. Assembling our numbers, we focused only on the most recent bestsellers (in particular, books published since Gans’s study), omitting any bestselling books originally published before 1995 (for example, classics such as W.E.B. DuBois’s Souls of Black Folk and Max Weber’s Protestant Ethic and the Spirit of Capitalism, both of which had high sales numbers in our data). So, since we only had data since 2004, and because retail sales tend to drop significantly just a few years after publication, our findings likely favor newer books. 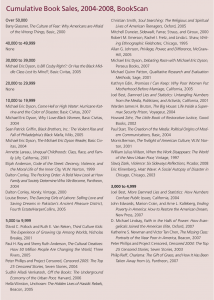 Our search yielded a list of 37 bestsellers in sociology, reported in grouped numerical intervals. (Though our list resembles Gans’s, we warn again that it should not be compared directly due to different data sources, methods, and time periods.) Barry Glassner’s The Culture of Fear was the only book to sell over 50,000 copies in the five-year period. Michael Eric Dyson, who does not have an advanced degree in sociology but is currently a sociology professor at Georgetown, has five books on the list (his Is Bill Cosby Right? being his single biggest seller on the list), and Dalton Conley, Joel Best, and Peter Phillips each have two. Other top-selling authors include Annette Lareau, Elijah Anderson, Sean Patrick Griffin, and Louise Brown. Cumulative Book Sales, 2004-2008, BookScan. Click to enlarge. The books on our list sold an average of 10,100 copies between 2004 and 2008, with the strongest years being those just after initial publication. Although we don’t have the data to provide much insight into why some books sold better than others, we do offer some speculations. For example, some books, such as Culture of Fear, probably benefited from social and political events unrelated to the book itself. In Glassner’s case, for instance, his book was featured in the 2002 Michael Moore documentary Bowling for Columbine. 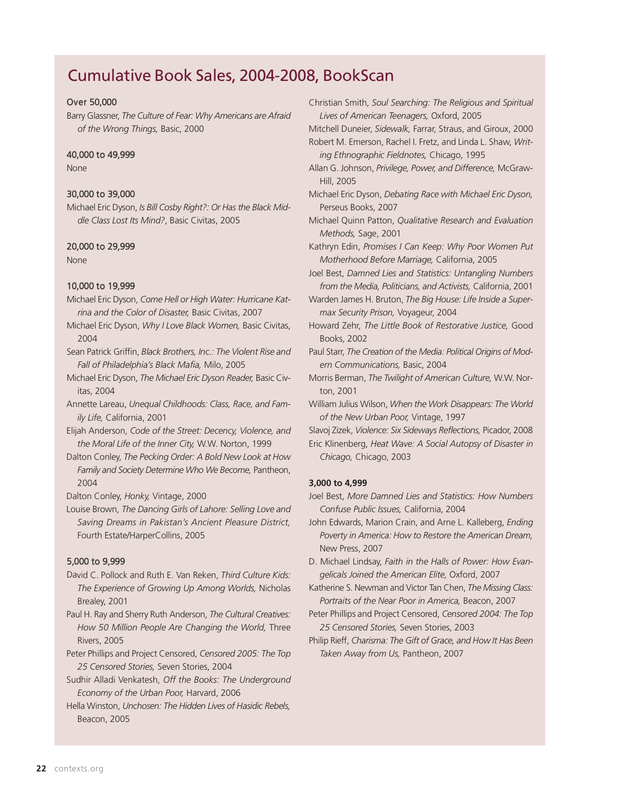 The popularity of some methods books, such as Robert Emerson et al.’s Writing Ethnographic Fieldnotes and Michael Patton’s Qualitative Research and Evaluation Methods, on the other hand, may stem in part from the rise of “cultural studies” and the desire for methods texts in these areas. As sociologist Michael Schudson has noted, gender studies, African American studies, and media studies all dwarf sociology sections in university and retail bookstores. As mentioned above, our list is likely biased against older books. Yet, many books published before 2004 have continued to sell well in recent years, comprising about a third of our list. 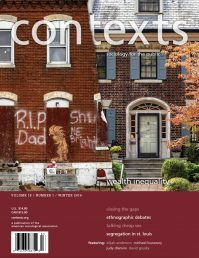 Sales for books like Anderson’s Code of the Street, Lareau’s Unequal Childhoods, and Mitchell Duneier’s Sidewalk, as well as methods books like Emerson et al.’s Writing Ethnographic Fieldnotes, all of which were published before 2004, increased sales for at least three of the years in our study. More generally, though, sales for the majority of the books on our list declined after the first year of publication. This appears to be a trend across the social sciences—of the top 1,000 social science books in our dataset, two-thirds experienced drops in sales after their first year on the shelves—and for non-fiction as a category. According to a Publisher’s Weekly report last year, fewer than ten non-fiction books sold more than one million copies in 2008. Despite these cautions, some sociology does sell extraordinarily well, even if professional sociologists aren’t the ones writing it. Physiologist Jared Diamond’s Pulitzer Prize-winning Guns, Germs, and Steel, which combines sociology with geography, history, and ecology, consistently ranked as a top performer in the social sciences with annual sales of more than 200,000, and journalist Michael Pollan’s The Omnivore’s Dilemma sold more than 250,000 copies in 2008 alone. In contrast, the top-selling book written by a sociologist in 2008 sold fewer than 10,000. Books from other disciplines were closer to the books on our list. Political scientist Robert Putnam’s Bowling Alone sold more than 50,000 copies across the five years, and Race Matters by Cornel West, the esteemed African American studies professor and public intellectual, sold more than 40,000. We also suspect Gladwell’s Blink and Outliers (which was reviewed by Joel Best in Contexts last year) to be top-sellers, as well as Naomi Klein’s No Logo or psychologist Daniel Gilbert’s Stumbling on Happiness, but their books do not appear in our BookScan data. Interestingly, we note that commercial presses still dominate the publishing of sociology books, even in light of declining sales. Of the 37 books on our list, commercial presses like Perseus, Random House, Sage, and Macmillan, as well as some smaller independent and non-profit presses, publish three-quarters of them. Gans had speculated that the interest of commercial presses in sociology books would diminish over time due to their low returns. But, as one academic publisher reminded us, some academic and non-profit presses like Oxford actually outperform many commercial presses. Indeed, Oxford, along with California, Chicago, and Harvard, published the remaining quarter of the books on our list. So, what helps a sociology book become a bestseller? Reviewing the books on our list, we see clear commonalities in the style of writing, topics engaged, and overall scope that may speak to the particular retail markets in which sociology texts sell well. While a content analysis of these books can’t give a definitive formula for generating a bestseller, we’ve distilled some common characteristics that likely resonate with the broader book market. Writing. Gans found bestselling books to be generally jargon-free, narrative-driven, and interdisciplinary in the sense they were accessible across academic disciplines. Most of our books seem to fit this description. For example, The Culture of Fear was applauded by top media outlets in part because of its combination of sociological analysis with an engaging journalistic writing style. The books on our list also include clear characters and vivid personalities such as the single mothers and suburban families in Unequal Childhoods and Hassan, the Greenwich Village vendor who appears in the first few pages of Sidewalk. Gans speculated that a jargon-free writing style and memorable narratives helped authors build loyal readerships, which facilitated the success of their future books. The repeat appearances of Dyson, Conley, and Best on our list certainly lend support to this idea. Not surprisingly, a number of authors on our list are themselves interdisciplinary. Conley is an adjunct professor of community medicine at Mount Sinai University and the Dean of Social Sciences at New York University, while Dyson has held appointments as a humanities professor in top universities and seminaries and is a frequent contributor to television programs, magazines, and websites. Topics. While clear writing makes the work comprehensible, not all topics seem to resonate equally with a broader public audience. Gans found sociology was on the cutting edge of the American public’s interest in poverty and racial inequality in the 1960s; books like Tally’s Corner, Blaming the Victim, and Worlds of Pain tapped into the current. Gans also found books that focused on family, children, or friends (such as Lillian Rubin’s books) sold particularly well. Similarly, we find books about race, ethnicity, and inequality continue to take top spots. In our list, BookScan identifies eight as books about ethnic studies, race relations, and African American studies. Religion and media are also popular subjects. Unlike Gans, who found very few criminology books, we found three. Including Anderson’s Code of the Streets, Sudhir Venkatesh’s Off the Books, and Griffin’s Black Brothers, Inc., would bring our criminology total to at least five. The success of criminology books not only reflects a widespread societal interest in crime, but also the rise of criminology as a subfield within sociology. Only two books address issues related to children, marriage, or family, and even fewer address politics or social movements. One way to interpret this finding is to suggest that these areas may have dropped off the public’s radar since Gans’s study. Instead, since these subfields clearly remain vibrant in the discipline, we suspect that many readers have turned to other experts in political science and cultural studies, or perhaps television pundits, for insights into these areas. If sociology hopes to make a bigger impact on the public, reclaiming some of these topics might be one place to start. Scope. We also notice fewer books (though there are some notable exceptions) that claim to offer a “big picture” take on American society and culture writ large in the manner of Lonely Crowd. Sociologists seem to be writing fewer books offering broad commentary on American life, tending instead toward increasing specialization and a focus on difference rather than community. This is certainly the case in the journals. Sociologists are now producing work as experts on fine-grained topics like the role of media in producing unfounded fear, the governmental response to Hurricane Katrina, the red-light districts of Pakistan, or an African American crime syndicate in Detroit. This is not to say that all books are so specialized, and we are not sure whether increased specialization is to the benefit or detriment of sociology’s public voice. In fact, fewer “big” books on our list may simply reflect a trend in the book market writ large. According to one publisher we spoke to, “There has been a fragmenting of all markets. That’s why people like Oprah are so important—there are so few single channels that attract so wide a population. There aren’t the chances that one book like Habits of the Heart would sell as well today. It’s much less likely for it to happen today than it was 20 years ago, and that’s part of the larger, general fragmentation that is occurring throughout all of society.” However, a subtle shift toward specialization indicated by our list does signal that sociologists are unlikely to be the public’s go-to experts for insightful social commentary on a broader scale. While our list is by no means definitive or exhaustive (not only because it represents just 75 percent of the retail market), it nonetheless provides a starting point for thinking about where sociology has made (and might make) an impact on public life. Some of the reviewers suggested other methods for collecting data, such as surveying some of the top-selling authors on our list to check for discrepancies in the BookScan data and solicit reflections on why some books sell and others do not. 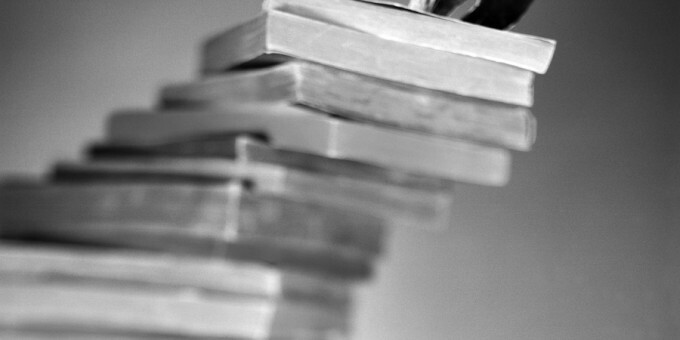 We encourage future studies that combine data from multiple sources, including authors themselves, in order to move toward a more comprehensive bestseller list. We hope our list can be a reference or signpost for these studies, much like Gans’s list was for our own. If there is an argument resting in the data we have gathered, perhaps it is the same one Gans made over a decade ago—to the extent that sociology hopes to impact public life, writing bestsellers may not be the best way to do so. 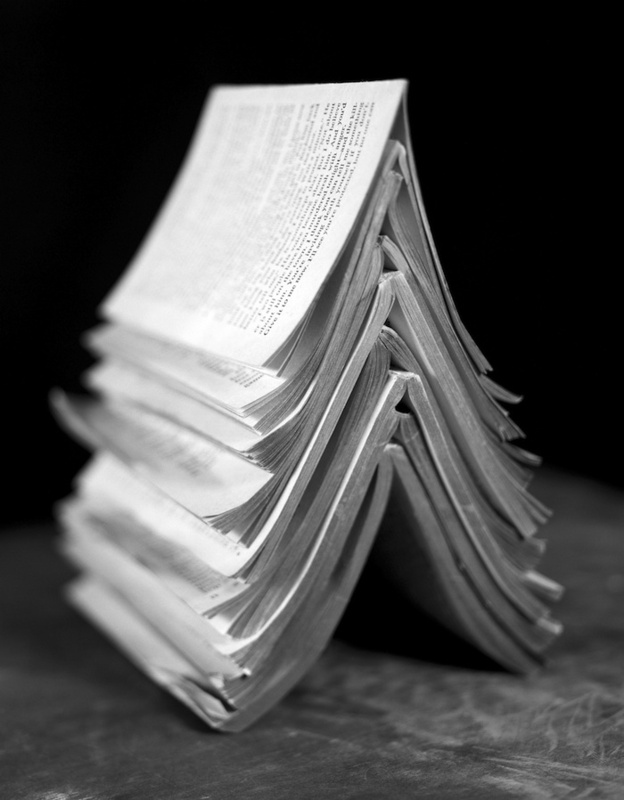 Of all the books on our list, a small minority sold more than 10,000 copies. On the other hand, books like Barbara Ehrenreich’s Nickel and Dimed and Dave Eggers’s Zeitoun undoubtedly sell better than the “sociology” books on our list, but they share some of the same characteristics, such as style, tone, and subject matter. Perhaps the incentive structures within academia have changed so that writing bestsellers is no longer an ambition of sociologists (and maybe it never really was). Indeed, one publisher lamented to us that sociologists, perhaps more than other academics he works with, are reluctant to promote their published works with the public and even view the idea of competing in the book marketplace with “hostility.” He went on to say, “If you want to be an author that sells well… you had better be the quintessential salesperson to drive that book’s success.” Authors in all fields and for all types of publications and presses are now expected to act as their own promotion agents, setting up Facebook accounts and hustling at readings and book signings. That convention may deeply unsettle some sociologists. If the institutional and cultural incentives have changed within sociology, then we might at least expect some of the classics—written at a time when engaging the public was maybe more of a premium—to still be going strong. However, when we checked to see how some of the books on Gans’s list fared in the retail market today, we found mixed evidence that they were still selling. While some titles, such as Habits of the Heart and Arlie Hochschild’s The Second Shift, continue to fare well, most, including Lonely Crowd, sold less than a few hundred copies in five years. If writing a bestseller is not the best way to reach the public, then writing opinion pieces, magazine articles, or working to get our work covered by journalists might be the next best option. Gans cautioned against giving away too much to journalists, but even Riesman had journalists like William H. Whyte and Anthony Lukas in his midst, and they helped shape sociology for the better. This is not to say that Freakonomics, the product of a curious yet compelling collaboration between an economist and journalist, should be the model for bringing sociology to the public. But it is in our interest to promote and encourage bestsellers that think and read sociologically, whether or not they are written by our colleagues. Of course, much as the books on our list, that idea might be a hard sell. Herbert J. Gans. “Best-Sellers by Sociologists: An Exploratory Study.” Contemporary Sociology (1997), 26: 131-135. A foundational piece for obvious reasons. Laura J. Miller. Reluctant Capitalists: Bookselling and the Culture of Consumption (University of Chicago Press, 2006). An excellent treatment of bookselling and consumption in America. Publisher’s Weekly (March 23, 2009), “Facts and Figures on Parade.” Annual issue reporting sales figures from the previous year’s shipped-and-billed numbers as confidentially reported by publishers. Available online. Wesley Longhofer is a Ph.D. student in the sociology department at the University of Minnesota and a member of the Contexts graduate student editorial board. He studies globalization and organizations. Shannon Golden is a Ph.D. student in the sociology department at the University of Minnesota and a member of the Contexts graduate student editorial board. She studies human rights. Arturo Baiocchi is a Ph.D. student in the sociology department at the University of Minnesota and a member of the Contexts graduate student editorial board. He studies medical sociology and health. While the article is a good starting point, it only scratches the surface. As the author of a newly published book on race and real estate http://www.anteropietila.com, I am trying to break into the market and find it extremely difficult. One key pre-requisite of success, book reviews, has virtually disappeared from mass-market newspapers. So unless you are lucky enough to get reviewed by The New York Times and/or The Washington Post, you are pretty much dead. Similarly, not many radio listeners are likely to hear about you unless you are lucky enough to get on Diane Rehm or Terry Gross's Fresh Air. Let me elaborate. My book covers a 130-year span from the Civil War to the subprime mess. Milesposts include Baltimore's pioneeering 1910 residential segregation law, restrictive covenants, the redlining of 239 cities by FDR's administration (which sanctioned predatory lending), blockbusting, white flight. My book, "Not in My Neighborhood: How Bigotry Shaped a Great American City," is arguably the most comprehensive treatment of those subjects available. It is highly readable: Beryl Satter, author of "Family Properties," calls my book "a page-turner, chock-full of riveting and shocking stories and vivid, unforgettable characters." As far as the trade goes, however, the book has one killer drawback. It documents the evolution of residential segregation and real estate through the prism of Baltimore Simply put, the book has been branded as a local book. Yet Baltimore was a trailblazer city that, in 1910 when the residential segregation law was enacted, was ruled by political Progressives. Because Baltimore also was a hotbed of eugenics, the book it offers some of the most compelling documentation available anywhere of such subjects as anti-Semitism (including anti-Semitism by Jewish builders who refused to sell or rent to fellow Jews) and black/Jewish tensions which in Baltimore began in 1910, when department stores were segregated and sharpened after Hitler came to power because black leaders were suspected of harboring anti-Semitism. In the "old" times, one could have reasonably expected that a book of this scope and ambition would have been widely reviewed. Alas, this has not happened in today's circumstances. I don't know why. But I know the following: In the "old" times, one paper that might have been interested in the topic (because of its home city's history) would have been the Chicago Tribune. No such luck this time. Since the book was reviewed in the Baltimore Sun, which is owned by the same company, the Trib has not touched it. Instead a review appears on the Trib website. Ditto for the Los Angeles Times, also owned by the Trib. There are lots of other factors that I do not claim to understand. For eeample, it seems to me that many sociological titles may be hurt by the unforgiving returns policy that many bookstore chains have adopted. A final note: We are moving toward e-books. They may be a blessing or a curse. But the explosive growth that is forecast for the next few years surely offers new opportunities. :I love reading reeiwvs about books. Books are a huge hobby to me. I would much rather read a book then go to a movie anytime. I love this Book Cellar website you have put together here. I return frequently just to see you new post on different categories of book related subject matter. Thank You Sam Guy. If your real?